ERICO’s ISO 9001 certified quality control procedures and proprietay automated manufacturing processes have made ERFLEX FLEXIBAR the preferred conductor for panelboard designers and assemblers throughout Europre ans the Americas. ERIFLEX FLEXIBAR has many years of proven low voltage application success throughout the world. Internal copper laminates are free to slide within the insulation, offering unlimited twisting and bending possibilities for panelboard assembly. The cost of lugs and associated labor is eliminated when using ERIFLEX FLEXIBAR. 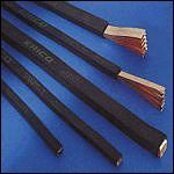 It is the first cost effective alternative to diameter electrical cable with lugs or solid busbar for panelboard construction.